There are certain things in our kitchens we can’t live without. I don’t mean the obvious ones—the sink, the stove, and the double chocolate fudge ice cream in the freezer. I’m talking about kitchen gadgets—those culinary weapons that make cooking more fun and productive. For openers, there’s the hands-free can opener. I was navigating my way through Bed Bath and Beyond with my teenage daughter, Elizabeth, when suddenly, something caught her eye. She beelined toward the One Direction memorabilia. I was surprised when she stopped at the hands-free can opener display. She picked up the white, oblong gadget that looked to me like the ultrasound transducer that had revealed thirteen years earlier that Elizabeth was a girl. “It’s the world’s first cordless hands free can opener—I saw this advertised on TV!” said Elizabeth. “I’ve seen that too . . .” I nodded vigorously. “You put it on top of the can, push the button and the opener walks around the can by itself and then shuts off automatically when it’s done.” I reflected on the last time I’d tried to open a can of chili with my manual can opener and discovered I’d either grown weak, arthritic, or was subconsciously trying to avoid a bad case of heartburn. The experience taught me that trying to pry open a can of chili without the most efficient tool can be destructive not only to the can, but also to your kitchen walls, ceiling and anyone within a 100-yard radius. I didn’t need much convincing from Elizabeth to purchase the One-Touch Can Opener. With my 20% off coupon the $19.99 can opener came to just $25. (The One Direction poster cost extra). At home I inserted 2 AA batteries and watched in awe as the hands-free device walked around a can of tuna without assistance from me. It safely cut from the side of the can, leaving no sharp edges. A built in magnet picked up the lid so the only thing I had to fish out was the tuna. It was so thrilling to operate that I started opening cans just for fun. Two cans of chili and three chili dogs later, I was wishing that Maalox also came in a can. A few days later Elizabeth was scraping her uneaten serving of chili-tuna casserole into the dog bowl and threatening to donate our remaining cans of food to the local Food Bank. 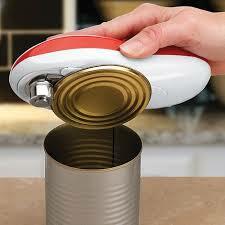 The hands-free can opener may not improve my cooking, but it makes food preparation easier and more efficient. Some reviews suggest that the One-Touch has a reputation for burning through batteries and that it’s difficult to detach the can from the can opener if the battery runs out in the middle of opening a can. That might explain why the “As seen on TV One-Touch Can Opener” is no longer seen on TV. Still, I’ve discovered that, like Maalox, a hands-free can opener is something I can’t live without. The Tornado has replaced The One-Touch hands-free can opener at Bed Bath and Beyond. Similar products include Black & Decker Gizmo, Hamilton Beach Walk ‘N Cut, and Sharper Image No Hands Auto Can Opener. I got two n the mail. Still haven’t figures out how to make the suckers work. Right now the only operable can opener in the house is a 79 cent one from the Dollar Store, Help. I’d stick with the 79 cent option. At that price it’s practically disposable! It’s a fun conversation piece to boot! Thank you for sharing this cool gadget! I definitely can use it. I have a few Pampered Chef products, but the only time I truly feel like a pampered chef is on the rare occasion when some one besides me does the dishes. I need that! We are on our 3rd or 4th manual can opener in as many years! Oh my! I’ve kept disposable razors longer than that! Now, if they could only make a wine bottle opener version like this! That would make a great party trick! My boyfriend has something similar, and it takes me forever to latch the thing onto the can. By the time it’s open, my fingers are safe from sharp edges, but the contents from the can have expired. I didn’t even know such a device existed. I’m still using the old-fashioned manual one. Sorry to have been gone for so long. We were without internet for two weeks and then I traveled to the US for nearly another two. So glad to be home in Cuenca again! I hope you had a nice trip! Oh no; another gadget I discovered I can’t live without. Bed Bath & Beyond is a master of stocking objects you never knew you needed! The most dangerous tack is to go in for only one thing. Guaranteed you walk out with a whole shopping cart full of essentials. The trick is to walk in with a huge list. You’ll be kept so busy focusing on what you need that you won’t be tempted by impulse items. Do they sell closet-lengthening kits? So true. I recently learned that I “needed” a strawberry de-stemmer, only to learn that I’m better off using a knife. Just don’t go for the double tornado. I hear it’s quite dangerous. The chili tuna Maalox thing, cheap and easy. Love ya’. the one we had ate batteries. I got a few opened cans out of it then it would stop in the middle of opening the 3rd can. I stick with my heavy duty manual one..
Good thing for old faithful, eh? Yes, its got plastic wrapped handles to protect your hands, very sturdy and reliable.